Ryan O'Hearn is tagged out at the plate trying to score on a Brian Goodwin sacrifice fly. PITTSBURGH — Ryan Lavarnway was an unlikely candidate to get a big hit in a pressure situation for the Pirates. The 30-year-old fourth-string catcher was playing his 142nd career game, spread out over seven seasons with five teams, and spent most of 2018 with Triple-A Indianapolis. 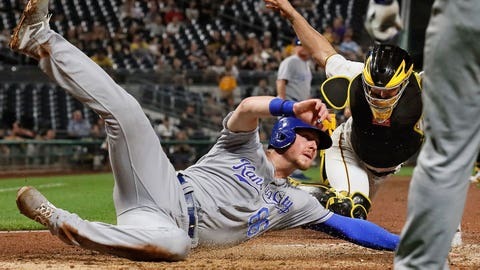 In his second major league at-bat of the season, Lavarnway drove in the winning run with a pinch-hit single in the 11th inning, giving Pittsburgh a 2-1 victory over the Kansas City Royals. Jameson Taillon had a career-high 11 strikeouts and Colin Moran homered for Pittsburgh. It was the second straight night a backup catcher came through for the Pirates. Jacob Stallings had a game-ending single on Monday night. Stallings and Lavarnway split catching duties all season in Indianapolis before being called up for depth in September. Pirates manager Clint Hurdle said at the time he wanted to honor the work Lavarnway had done this season. Starling Marte led off the 11th with an infield single off Burch Smith (1-6). Josh Bell walked and Burch struck out Francisco Cervelli before Adam Frazier was intentionally walked to load the bases, setting up Lavarnway’s walk-off hit to shallow center. Taillon pitched seven scoreless innings, allowing four hits and a walk. His previous career high in strikeouts was 10, set on July 12. “I worked the top of the strike zone a little bit more than usual, I would say, and then my curveball was the best it’s been the second half,” Taillon said. It looked like the Royals might get to Taillon in the top of the seventh. With runners on second and third, Brian Goodwin hit a flyball to right fielder Pablo Reyes, who threw out Ryan O’Hearn at the plate. It was the first outfield assist for Reyes, a rookie playing his second game in right field. Pinch-hitter Hunter Dozier tied the game in the ninth with a double off Pirates closer Felipe Vazquez that scored Jorge Bonifacio. Left fielder Corey Dickerson threw to shortstop Jordy Mercer, who relayed home to throw out Salvador Perez and preserve the tie. Vazquez had not blown a save since May 31, a string of 24 consecutive opportunities converted. Kyle Crick (3-2) retired the side on 10 pitches in the 11th to earn the win. Moran had a pinch-hit home run with two outs in the seventh, his 10th homer this season. The Pirates improved to 14-5 in interleague play, the second-best record in the majors behind the Boston Red Sox. Pirates: Frazier did not start but said he was “fine” after fouling a ball off his right knee and leaving Monday’s game with discomfort. He grounded into a fielder’s choice in the ninth and remained in the game in left field. … C Elias Diaz (hamstring) made his first appearance since Aug. 31. He walked as a pinch-hitter in the ninth. Royals: Perez was a late scratch with a recurrence of a nagging left thumb injury. He singled in the ninth. … RHP Jorge Lopez (bruised rib) has still not thrown a between-starts bullpen session. His next turn in the rotation is Thursday against Detroit. The team has not announced a probable pitcher. Royals: Heath Fillmyer (3-1, 4.76 ERA) is scheduled to start the series finale Wednesday. The rookie allowed 10 runs over his previous two starts. Pirates: Chris Archer (4-8, 4.66 ERA) has lost three straight decisions and is 1-4 with a 5.19 ERA since returning from an abdominal injury in early July.